Digital transformation has immense potential to unlock $1.3 trillion of value for the electricity sector; the industry must now embrace digitization. The electricity sector is ripe for realizing value from rapid digital transformation; we estimate that there is $1.3 trillion of value to be captured globally from 2016-2025. Five initiatives are worth more than $100 billion over the next 10 years and should be prioritized for investment. By leveraging the building blocks of digitization, such as service platforms, smart devices, the ‘cloud’ and advanced analytics, companies in the industry have the opportunity to increase the asset life cycle of infrastructure, optimize electricity network flows and innovate with customer-centric products. New pools of value could also be tapped ‘beyond the electron’ by harnessing big data across sectors. Yet the maturity of digital initiatives in the industry is varied – from projects using advanced analytics to optimize assets and the widespread implementation of smart meters, to early moves by some utilities to manage and integrate distributed generation resources. Industry players agree on the need to make deeper customer engagement a priority and the pivotal role of digital technologies in making this a reality. Energy technology providers are playing a key role in digitizing the industry, releasing a suite of smart turbines and panels, and sensors for commercial infrastructure. They are also developing connectivity platforms for industrial, commercial and retail customers. Established players and startups alike are experimenting on the fringes of the industry. The burgeoning home energy market is a case in point, with more than 100 (non-utility) actors capturing value.For a list of these actors, see CleanTechnica¹. With higher potential business value, smart industry and smart city markets are following suit in the business-to-business (B2B) and B2B-to-consumer spaces. As the sector continues to adapt to the various transformations taking place, digitization must be a key priority, and, indeed, can support development of new business models to respond to these industry shifts. Digital technologies have tremendous potential to contribute to growth in the sector and help deliver exceptional shareholder, customer and environmental value. 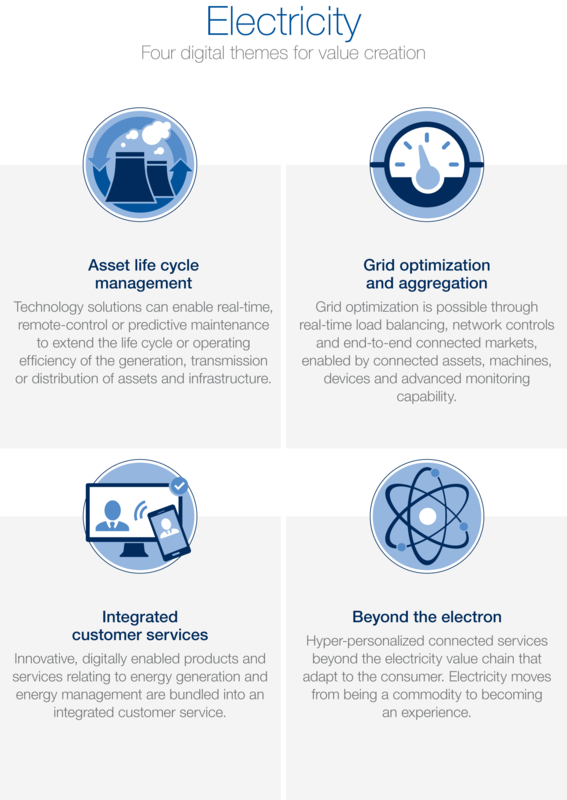 Four themes – asset life cycle management, grid optimization and aggregation, integrated customer services and beyond the electron – emerge for creating value (see graphic below). Within each theme, a number of digital initiatives can be pursued, each with our estimated ‘value at stake’ to enable prioritization. Asset life cycle management has the greatest value potential among all the digital initiatives, to the tune of $480 billion over the next ten years. Utility firms are likely to improve margins from lower repair and maintenance costs, lower downtime of assets and fewer critical breakdowns. Grid optimization and aggregation initiatives are together worth a projected $440 billion to industry and $1.2 trillion to society, through enabling smarter saving choices for customers, new job creation and lower peak demand, reducing carbon emissions. Integrated customer services. Digital initiatives could be worth up to $440 billion to industry, with value migration driven by consumer renewables. There is significant value to be captured by developing plays in integrating renewable resources and investing in digital channels that empower the consumer to manage their electricity consumption. “Beyond the electron” initiatives could not be quantified and are excluded from the value at stake analysis. Such initiatives could be described as ‘unknown unknowns’ to industry. Nevertheless, big wins in customer value are expected for those that move quickly to market such services. 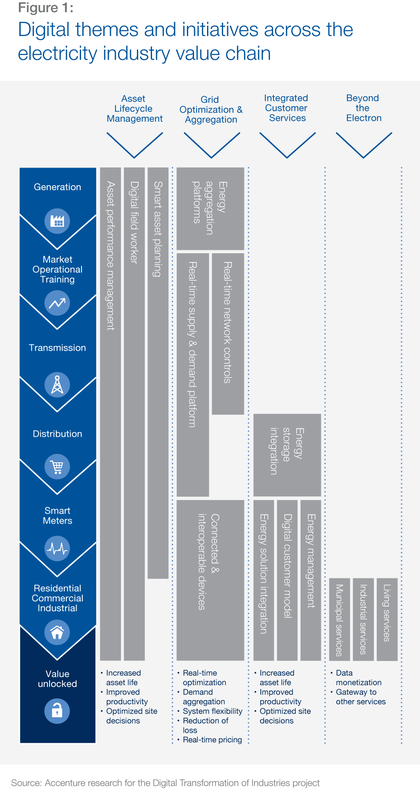 Figure 1 below maps digital initiatives to the part of the electricity value chain that they relate to, from generation to consumption. Each initiative clearly illustrates how these digital themes are relevant to the electricity industry as it evolves over the next few years. No matter what shape the electricity company of the future takes, digital is likely to be a fundamental part of it. This report offers an estimate of the value pools and a series of pragmatic recommendations that enterprises can take to digitally transform their operations and business model, and ultimately become a digital champion. How do you reimagine the design of the energy system, given near-term digital and technological innovations which include predictive forecasting and energy storage? What infrastructure and systems are required to meet tomorrow’s energy demand? In economies transitioning to a lower carbon, more decentralized energy system, what incentives can be created by regulators and policymakers to optimize the electricity system and create a better functioning market? What business- and operating-models are pre-requisites for energy companies to gain a greater share of the future industry profit pools beyond the electron – for instance, from connected home, smart car, buildings and cities, and industrial services? Electricity is one of six industries (along with automotive, consumer, healthcare, logistics and media) that have been the focus of the World Economic Forum’s Digital Transformation of Industries (DTI) 2016 project. An overview of the DTI program can be found here. Our in-depth findings about the digital transformation of the electricity industry are available in a white paper, which can be downloaded here.